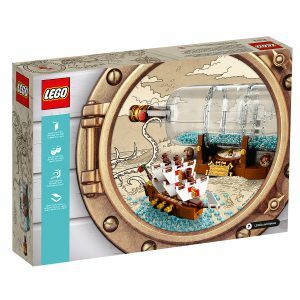 The LEGO Group confirmed the details of the new LEGO Ideas “Ship in a Bottle” set today with the following press release. Available from 1st Feb. No VIP early access. Create a timeless classic with LEGO bricks! Show you are a true craftsman when you create a Ship in a Bottle with LEGO bricks! Build this beautiful ship named ‘Leviathan’, including the captain’s quarters, masts, crow’s nest, sails, flag and 6 cannons. Place it inside the brick-built bottle, featuring a buildable cork and wax seal. Then showcase your nostalgic, nautical creation on the display stand, complete with the ship’s nameplate and a compass with a spinning needle.